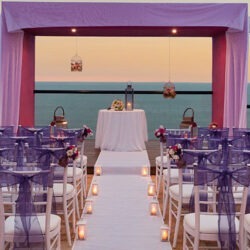 Puerto Vallarta is one of our most popular locations for a destination wedding in Mexico. We like to describe this location as the Pacific coast’s favourite beach resort site. Puerto Vallarta resorts are great because of this region’s dedication to tourists. Notably, you will have plenty of options when it comes to choosing the perfect resort. 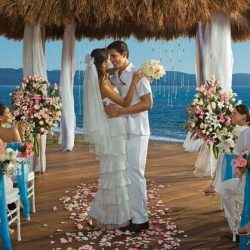 You will find all the great amenities you need for an amazing destination wedding, water sports, stunning beaches, and tangerine sunsets. Talk about romantic. Importantly, you will find attractions and excursions such as zip-lining, hidden beach, and shopping in the El Malecon. Also, you will find an incredible nightlife paired with contemporary sculptures. Best of all? Puerto Vallarta is a short flight if you live on the Westcoast, which can be very convenient for people looking to not travel a long distance. We can also find you a resort as close to the airport as possible if that’s what you need! Please Contact Us if you have any questions as all our services are complimentary. Below are samples of Puerto Vallarta resorts that we recommend.